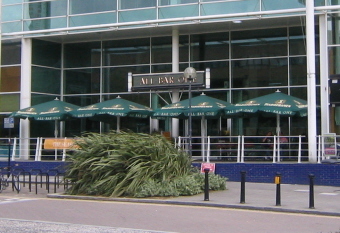 A modern, purpose built pub adjacent to a Lloyd�s No. 1 outlet, this has the usual identikit feel of many of the companies pubs and there is All Bar One branding everywhere you look from the patio umbrellas to the windows to the clock and even the doormat. Inside it�s a single, high ceiling room having a slightly industrial feel with all the air conditioning ducting on display. Windows take up the entire front wall and this offers an excellent view over to the office blocks opposite. The usual shelves of wine bottles are arranged as a backdrop to the bar with a couple of ladders at each end for reaching the higher ones. Decor wise the paintwork is mostly an inoffensive, pale creamy brown although the left hand wall is painted in a contrasting dark green and contains a wide selection of cog wheels arranged in to some artwork. There is a small patio area with a few tables and chairs at the front of the pub. Flooring is pine strip work and this theme extends to the wood clad bar. Although probably geared towards the food side of things, there are a number of high tables and chairs at the bar end of the pub where you�d presumably be welcome to sit and have a pint. Food wise, the menu looked reasonably extensive and was divided in to section such as tapas, sharing, burgers, �in a bowl� and classics. The latter consisted of pub staples such as Fish & Chips, Gammon & Egg, Sausage & Mash, etc., with most of the mains being priced around the �8 - �9 mark. A chalk board offered a small selection of deserts and I thought the Banoffee Trifle sounded appealing. Beer choice was very disappointing with just keg London Pride and the solitary cider was Aspall�s Suffolk. I use this bar as someone that regularly stays in MK and once you realize that its a 'place to be seen' rather than perhaps a place where you will find fine real ales, its great. The selection of European beers is OK I like Wies beer and they do a good one on tap. I have eaten here a few times and the food is good value for money. It has a good atmosphere, especially if you are out with the boys/girls. All this said, I use it in the week and not weekends, so things could be very different. Pretentious drinkers, avoid on a Friday after work, full of suit types! Have been mid-week evenings with the missus and it's laid back and pleasant. Went friday night with a friend and it was buzzing! Had a good night (even though I'm a middle aged grumpy). Good choice of lager and wine. I don't drink ales so can't comment on that.